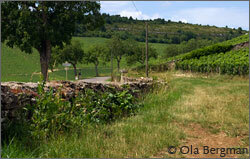 lorent Garaudet is running a minuscule domaine in Monthelie, one of the smaller villages on the Côte d'Or. While some other winegrowers bottle their smallest cuvées in numbered bottles he considers cuvées of that size to be large. He is a fan of 400-litre barrels and oak, but not necessarily new oak. 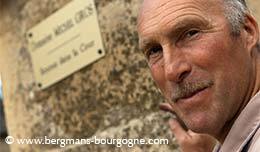 With only two hectares of vines – in Monthelie, Meursault and Puligny-Montrachet – this is a one-man-enterprise. 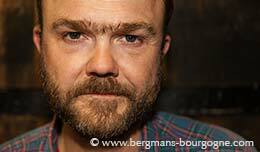 – I'm the fifth generation of winegrowers in my family, explains Florent Garaudet. 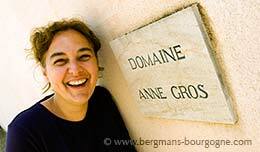 My father is still working with his domaine and I have put together my own domaine with vines from my family, both my mother's side and from my father's side. – My two hectares cover seven appellations, so the cuvées I produce are almost non-existent. It is not a gigantic task to take care of two hectares, so it gives me the opportunity to be very careful when I work. 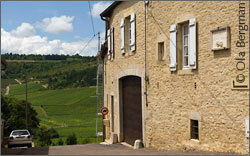 Domaine Florent Garaudet is located on one of Monthelie's quiet streets. Behind large grey doors boasting the logo of the domaine you'll find Florent Garaudet's two cellars, the lower one resting directly on the bedrock. 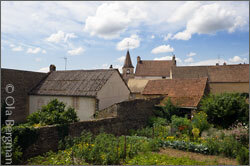 Monthelie is the smallest village on the Côte de Beaune, squeezed in between Volnay, Meursault and Auxey-Duresses. It rests on top of a hill looking down on its neighbours. – The character of the Monthelie wines is somewhere between those of Pommard and Volnay, says Florent Garaudet. They have the finesse from Volnay and the body from Pommard. Geographically it is interesting because Monthelie is located on the same line along the Côte as Pommard, Volnay and Meursault. We are at the top of a cliff, with an almost ideal exposure. Monthelie is capable of producing very good wines of both colours, some which is quite unusual among the villages in Burgundy. 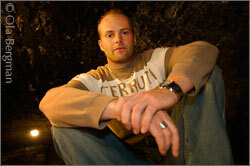 2010 was the year when Florent Garaudet bottled his first vintage. It was after studies at La Viti in Beaune and work experience in both the Languedoc and Pomerol he set up his own business and made his first harvest in 2008. – For my work experience I didn't want to go abroad because I feel there are so many treasures in France. I first went to Pic Saint Loup in the Languedoc, to Château La Roque. They have great vineyards and the exposure is very good. Then I went on to Pomerol and Château l'Enclos where I vinified 9,5 hectares. I was maître de chai, so I was the one taking the decisions. It was a great job. One thing he brought back home to Monthelie was the use of oak. In Pic Saint Loup he discovered the 400-litre barrels. The standard barrels in Burgundy hold 228 litres, but he prefers the larger barrels since he feels you get a better integration of the oak in the wine. – I use the 400-litre barrels because the ratio between volume and oak is interesting. The wine reacts with the new oak more slowly and you get a wine that is less marked by new oak. Florent Garaudet uses oak for the élevage for all his wines, from the Bourgogne Aligoté to the red Monthelie premier cru Les Riottes. It not necessarily new oak all the way and he manages to make wines that have balance and that doesn't strike you as particularly oaky. – All my wines spend time in barrels, but with different percentage of new oak, different coopers and different origins of the wood. For the Bourgogne Aligoté I don't use new oak at all, just barrels that are four or five years old. – Depending on where the oak for the barrels comes from you get a different character. For instance I don't use Allier oak for the reds, but I use it for the whites because it produces a wine that is very pure and elegant. I don't use Limozin oak for the whites because then you get a wine that is too heavy. People don't want their whites too heavy. They want them to have a certain amount of freshness, but not too much. In other words, you need to have a balance between acidity and body. His Meursault village is located below Les Santenots. This wine gets 60 per cent new barrels, all of the 400-litre kind. 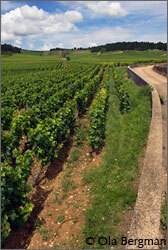 The Puligny-Montrachet village comes from various lieux-dits, all at the bottom of the slope. The vines are 50 years old and the wine gets less new oak, only 30 per cent. 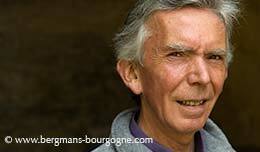 Overall Domaine Florent Garaudet has a high average age on its vines. 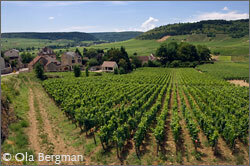 The Bourgogne rouge vines are 60 years old. Monthelie village 50 years. Monthelie premier cru Les Riottes 60 years. The Bourgogne blanc vines are slightly younger, 36 years old. – The Les Riottes is just behind us, says Florent Garaudet. On the Volnay hill. The yields are low, 40 hl/ha and I use 50 per cent new oak for the wine. It has an exposure to the south and it is a climat that produces a structured wine that is very fruity. – Another reason why I chose to go to the Languedoc and Bordeaux for work experience is that these regions are ahead of us in climatological terms. 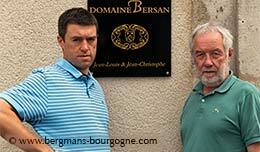 There is the global warming and in Burgundy we have reached a point where we have a good maturity every year. Before that wasn't always the case. With global warming we will end up where will have to make wines for keeping that have low acidity. In the Languedoc and Bordeaux they have a warm climate and still make reds that keep for long. Bordeaux is of course already well known and the Languedoc is moving ahead.